The Tesla Motors Model S electric car recently earned the highest possible rating of five stars in government crash tests. But that announcement wasn't good enough for the image-conscious company and its charismatic founder, Elon Musk. In fact, Tesla said Monday -- 11 days after the test results were announced -- that the Model S earned the highest crash test scores of any car ever tested. "Of all vehicles tested, including every major make and model approved for sale in the United States, the Model S set a new record for the lowest likelihood of injury to occupants," Tesla said in its statement. The National Highway Traffic Safety Administration's five-star safety rating system operates like the letter grade system used in classrooms in which any score above 90 is an A. While one student might get a 92 and another a 98; both would be A students. 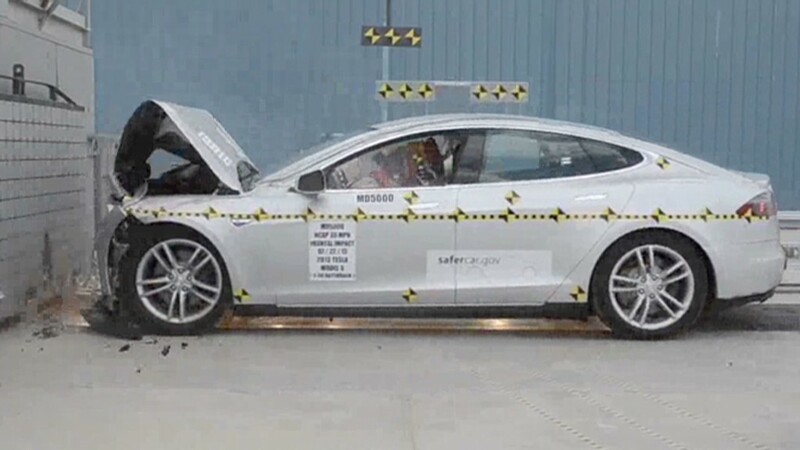 Tesla is saying, essentially, that it got an A plus in NHTSA's crash tests. And it got the best A plus ever. Tesla attributed its stellar performance partly to the lack of a gasoline engine under the hood, allowing the front end of the car to function as nothing but an enormous impact-absorbing "crush zone." The Model S also outperformed other models in the government's side pole impact test that mimics a vehicle sliding sideways into a post or tree. This is one of the most dangerous types of impacts. The Model S did exceptionally well in this test because of aluminum rods placed in the side of the vehicle, Tesla said. "A similar approach was used by the Apollo Lunar Lander," Tesla said in its statement. The Model S also outdid every other model in rollover resistance, Tesla said, "with the other top vehicles being approximately 50% worse." During separate independent testing, the Model S simply refused to turn over during even the hardest turns and "special means" were needed to get the car to flip, according to Tesla. The reason the car is so stable, Tesla said, is that its large, flat battery is mounted in the floor of the car, creating a very low center of gravity. As you might expect by now, the Model S also topped other cars in the roof crush test. In a independent validation of the Model S's roof crush strength, Tesla said, the car's roof was so strong that it broke the testing machine. In fact, according to Tesla, four fully loaded Model S sedans could be placed on top of a Model S without crushing the roof. Tesla also pointed out that, so far, no Tesla batteries have ever caught fire even after high speed impacts. "While this is statistically unlikely to remain the case long term, Tesla is unaware of any Model S or Roadster occupant fatalities in any car ever," the automaker said.